In case we ever go back there we can review what we liked. Writing is supposed to exercise your mind and keep it young – wish I could remember where I read this? Kinda stretches the vacation out a little longer. I am penning this vacation blog a little differently than past vacation blogs. In the past I wrote in a chronological style with a day by day diary of our vacation. This time I am posting the places we visited and the highlights from each location. Note, I don’t post the low-lights unless I am really ticked off about that particular experience. Amarillo: first stop and last stop. On the way to Colorado we had dinner at Sava! Italiano with old friends from Dallas, Mike and Jackie, who have moved there. After dinner they treated us to a glass of wine at the Crush Wine Bar and Deli in downtown Amarillo. Now Amarillo is one of those towns you don’t expect to find a wine bar but this one is very good. On the return trip we visited them again. Also had great visit with Mike’s dad LeRoy. He had loads of great reminiscences of growing up in Oak Cliff and WWII in the Pacific. Santa Fe: We just stopped their for lunch at our favorite Santa Fe restaurant ( Tomasita’s.) The cuisine is Northern New Mexico and is delicious. Warning: the chile stew is very hot!! It’s definitely not Texas Chili. We spent a morning at the hot springs. There are around 20 pools. The temperatures range from 93 to 110 degrees. 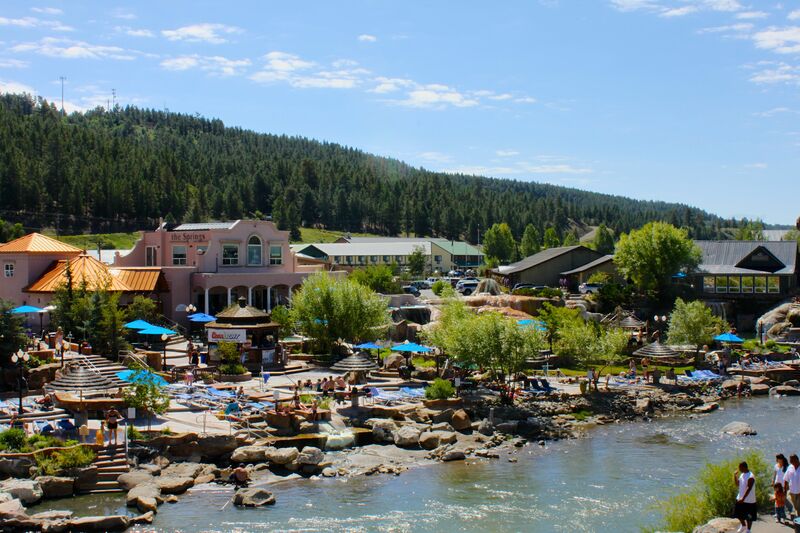 The pools are downtown on the banks of the San Juan River. That evening I resembled a lobster. Apparently, even on a cloudy day at 7800 feet above sea level you can get a sunburn in a couple of hours. 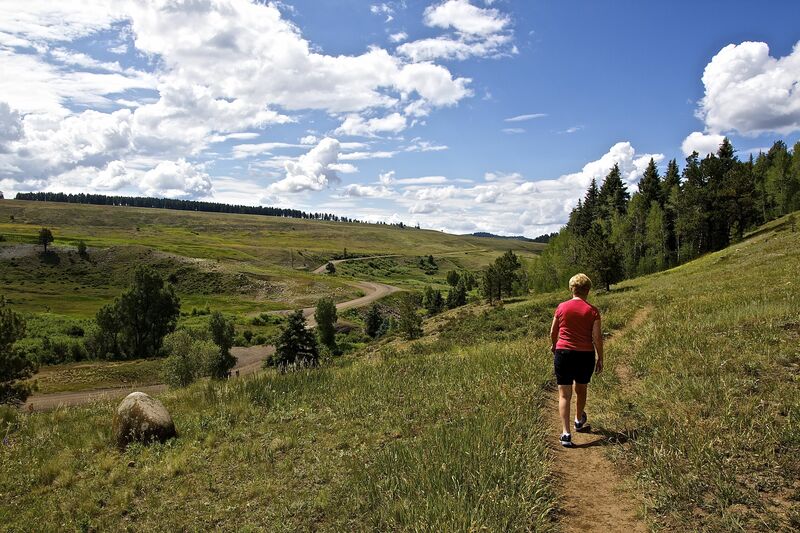 Blanco Basin Road: if your in the mood for a scenic drive while you are in Pagosa the Blanco Basin Road is a can’t miss option. Round trip is 40-50 miles depending on how far you go on an all weather road (aka: gravel). There are lots of scenic views and photo opportunities along the way. Spamalot: Musical by the Pagosa Springs Performing Arts Center was quite good considering the size of the town. However, either Spamalot has changed quite a bit since we saw it in Dallas or this group added quite a bit more sexual content. Hint, don’t take your kids to Spamalot in Pagosa Springs. Pierdra Trail: This is an easy hike along the banks of the Piedra River (what a coincidence). As with everything else in Pagosa Springs the hike is very scenic. Also, the drive out from the town to the trail is as well. Alley House Grill: The best restaurant n Pagosa Springs. If you only eat one meal in Pagosa Springs this is place to have it. Riff-raff Brewery: Good beer and some unique menu items. I recommend the cabrito burger. If you have two meals in Pagosa the 2nd should be here. Backroom Wine Bar: Wine bars seem to be sprouting up everywhere from at least Monmouth Illinois to Pagosa Springs Colorado. FYI: my son-in-law is opening a winery in Murphy Texas this fall. Please stop by and partake of a glass or two of vino there. Back to the Backroom Wine Bar. It’s small but the wine is good and the staff is friendly. What more could you ask for? Higher Grounds: coffee shop walking distance from the condo and very good. If I had a choice between Higher Grounds and Starbucks I would choose Higher Grounds. My friends know this is quite a compliment because I practically live at Starbucks in Dallas. Farrago Market Cafe: Farrago is a good lunch venue. Most of the seating is outside which is where you want to sit. The Alley House, the Back Door Wine Bar, and Farrago’s are all owned by the same chef and are all top notch. We met the chef who owns all three. She was very personable and obviously a great chef. 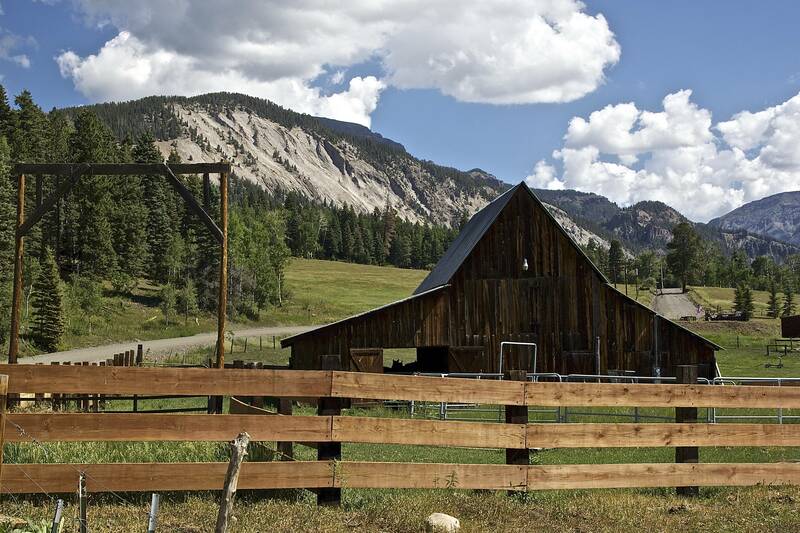 Pagosa Springs to Steamboat Springs: The most direct route from Pagosa to Steamboat is up the spine of Colorado. It’s a beautiful and often breathtaking drive. The highlight for me was Leadville. 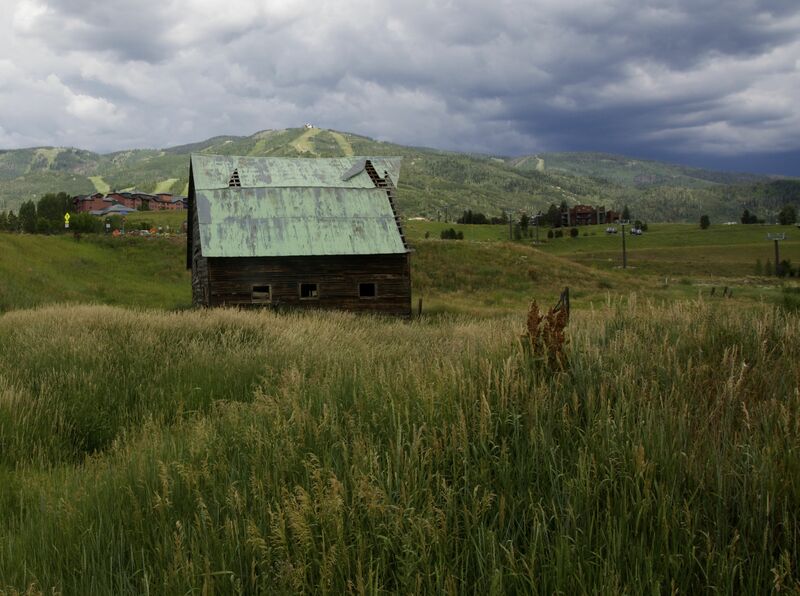 I’ve read about the Leadville ultra marathon and in that story Leadville comes across as a desolate, dying, small burg on the top of Colorado. It’s dying because the local mines closed. Well, Leadville is actually a good size community (2600) and seems to be thriving at least in the Summer. It is also the highest (in elevation) incorporated City in the U.S. at 10,152 feet above sea level. 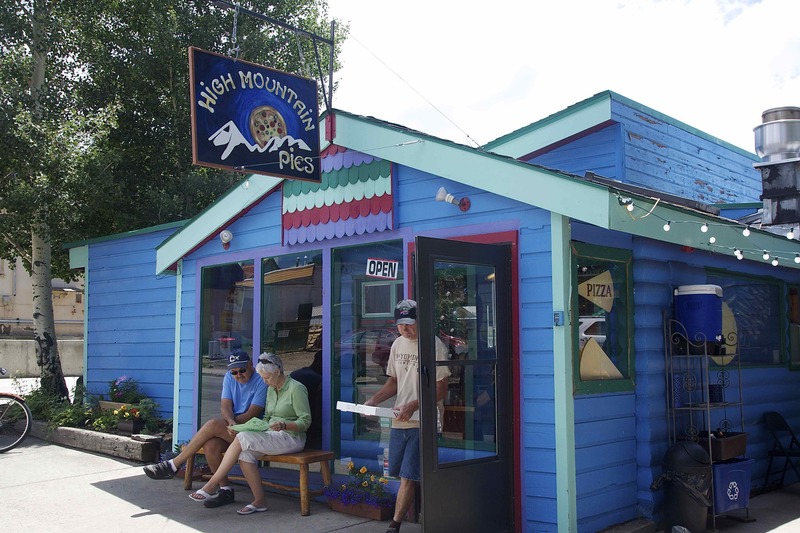 Furthermore, Leadville is the home of High Mountain Pies Restaurant. They served the best pizza I’ve had since I left Chicago in 1968! I considering going back next Summer and staying in Leadville just to eat more of their pizza. Fish Creek Falls: The falls was in a Coors commercial is the local advertisement. I never saw the commercial but I believe them. Anyway, it’s a short drive on a paved road to the falls. The fee to park is $5 but otherwise the park is free. There are trails to both the base of the falls and a scenic lookout. We did both because they are short. We enjoyed the scenic lookout more. If I return I’ll go in the middle to late afternoon. The photo opportunities should be better in the afternoon. The Sun rises right over the falls in the morning. There are also picnic areas in the park. An afternoon picnic and short walk to the scenic overlook for photos would be very enjoyable and relaxing. 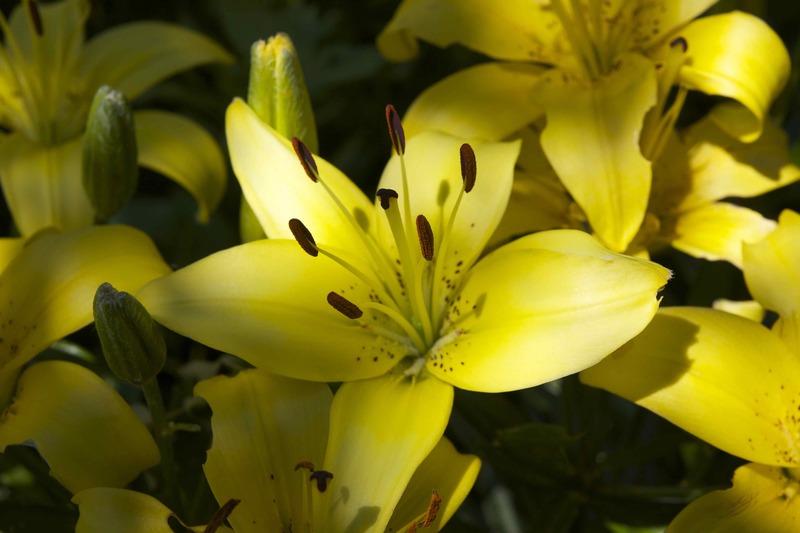 Yampa River Botanical Park: It’s small (6 acres) but contains thousands of flowers and is well worth visiting. SInce it is free you will definitely get your money’s worth. Strings Music Festival: We enjoyed a night of classical music at the Strings Music Festival venue. As with the Spamalot musical in Pagosa Springs the facility and quality of the concert was very, very impressive. 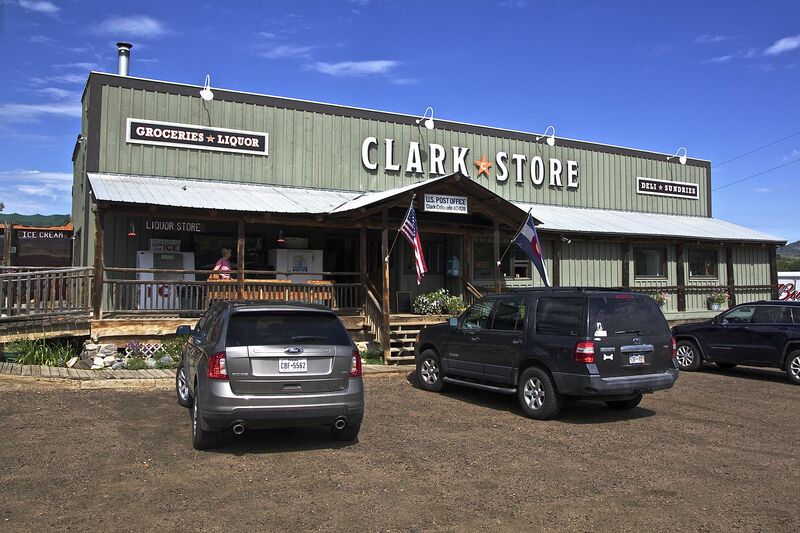 Highway 129 to Columbine, Co: This is a scenic drive north of Steamboat and on the way to Columbine we passed through the towns of Clark and Hahn’s Corner. Stopped at general store in Clark on the return trip for snacks. It’s worth the stop just for the ice cream but they don’t start selling it until 11AM. I had salt and vinegar chips for the first time in ages. My how salty they tasted! Creekside Cafe and Grill: We ate lunch here. It’s another good place to eat. Steamboat Springs seems to be overflowing with good, decent restaurants. As least compared with Pagosa Springs. Don’t go there for dinner – they serve breakfast and lunch only and close the doors at 2PM. Mambo Italiano: Mambo’s was my favorite restaurant in Steamboat. The best seats are outside if you visit in the Summer. I had my first mojito at Mambo’s. It was good. Hint – don’t eat the leaves in the drink. Ore House at the Pine Grove: The Ore House is a steak place pure and simple. Go here for the steaks and not the scenery. The restaurant was constructed to resemble a mine and has no great views of the mountains. The steaks and baked potatoes are great! Mahogany Ridge Brewery and Grill: We stopped here after our long drive from Pagosa Springs through Leadville. My head was still spinning from the Leadville pizza so I don’t remember the food. However, the beer was most excellent dude!. The drive home: The route from Steamboat Springs to Denver is very scenic. The Denver to Trinidad segment is Interstate Highway East of the Front Range and is pretty boring. The segment from Trinidad to Clayton New Mexico to Dalhart Texas to Amarillo is simply amazing because it’s true – there is nothing there. Miles and miles of nothing! So, be sure you purchase gas before turning off the Interstate! I was fascinated by the landscape on this segment because it is the setting for one of my favorite books – The Worst Hard Time by Timothy Egan. Driving through the land today I can’t imagine why people believed they could homestead this wind swept segment of the Great Plains. However the book chronicles the true story of some of the hardy settlers who survived (and some who did not) the Dust Bowl. It’s not a happy tale but often the really true stories are not all peaches and ice cream. I still have a copy of the book. If you want to read it I’ll be glad to pass it along. Well, that’s all there is because there isn’t anymore until the next trip. 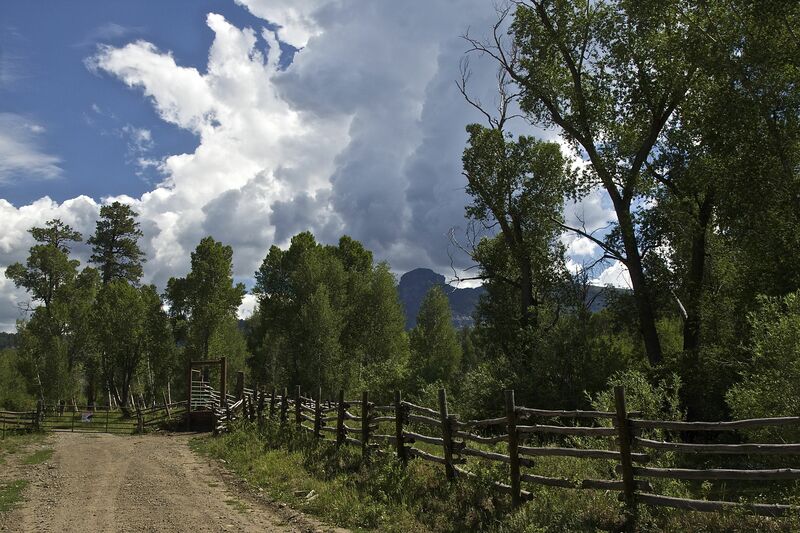 Leaving you with a photo from the Blanco Basin road outside of Pagosa Springs. I read a lot. Books, magazine articles, blogs, etc. I don’t usually blog about something I have read unless I consider it really top shelf. Therefore, I don’t often update my blog with book reviews. Just a few days ago I authored a blog on “The Ocean at the End of the Lane.” Now I find myself writing a blog on Watchmen. 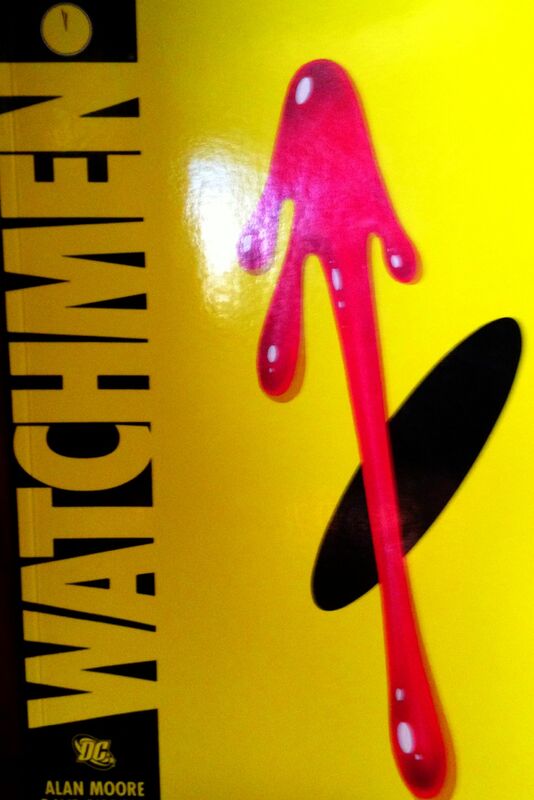 I really enjoyed Watchmen and will probably read it again in a few years just because it is so different. Watchmen is a graphic novel. We used to call them comic books, but my how they have changed since I was a kid reading Superman and Spiderman. Before you pass judgement be forewarned Time magazine named Watchmen one of the 100 best English language novels since Time started publication in 1923. I picked Watchmen up out of curiosity. How could a comic book, albeit a long, long one, be one of the 100 best English language novels? The setting for the novel is a dystopian future of 1985. The setting is mostly the United States although there is an interlude on Mars. Through an awful trick of fate Nixon is still President! If that is not bad enough the cold war is getting very hot and everyone is expecting World War III to break out any day. There are many other differences from what really transpired. For example, with the aid of the superheroes we won the Vietnam War. The Watchmen are none to “super” super heroes who for the most part don’t really have any super powers. The exception is this blue dude Dr. Manhattan. He got discombobulated in a nuclear accident a few years before our story begins and is not bound by space, time, or laws of physics. He reminds me of Michael Jordan. Watchmen begins with the murder of one of their own (The Comedian). They (primarily Rorschach and Nite Owl) investigate and uncover a plan which threatens to change the World as we know it. However since this an alternative future the World is not as we know it anyway. The book is non- linear and the story jumps around in both space and time constantly. There is also another narrative (Tales of the Black Freighter) intertwined with the main plot through the reading of one of the main plots characters. You are currently browsing the Number 6's Blog blog archives for August, 2013.